In the dying embers of the Clone Wars, Galen and Lyra Erso find themselve sin the wrong place at the right time. Galen is a scientist whose research into the energy transmission capabilities of Kyber crystals could bring power to the galaxy. Lyra is a gifted scout, explorer and scientist in her own right. James Luceno is the definition of a safe pair of hands for Star Wars and it shows. He’s got an instinctive grasp of Imperial politics and backbiting that manages to both be the bureaucratic slap fight it is and to demonstrate the banality and scope of the Empire’s evil. Krennic mutilates numerous worlds to get what amounts to a promotion, his rival Tarkin views people and resources as annoyances of equal value and the best the rest of the cast can do is huddle between them and hope they kill each other. We, of course, know they don’t. In fact we know how every element of this story ends and it’s to Luceno’s credit that the novel still works so well. 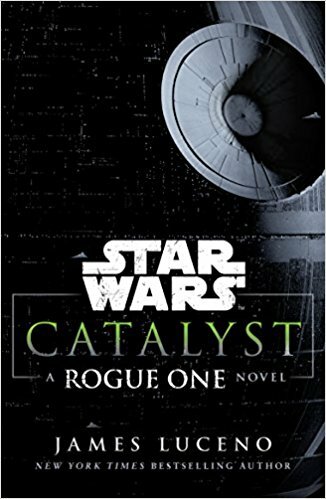 A big chunk of that is due to the extra view points he drops in; a morally bankrupt smuggler who plays both sides and realizes that isn’t sustainable, and Lyra Erso herself. Here given friends and the backstory her on-screen near fridging denied her, she becomes a more interesting and rounded character than her husband. Lyra is one of the Star Wars universe’s liminal people; not quite a soldier, not quite an explorer. She’s cautious and aware in the exact way Galen isn’t and the book is at its best when she and Krennic spar. Galen Erso fares a little less well, but, honestly, that’s because he isn’t especially interesting. Luceno does an excellent job of backfilling the character and much like on screen, he spends a lot of time thinking very hard about lots of things at once. But Galen’s blindness to Krennic’s plans plays as wilful more than once and the third act angst between the Ersos doesn’t feel especially earned. 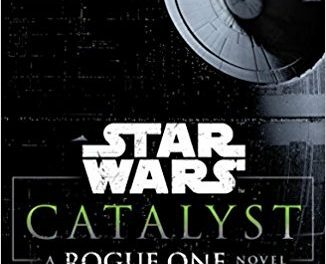 That being said, Catalyst is an excellent choice for anyone wanting a little background to Rogue One and a great piece of the eternal Star Wars jigsaw puzzle in its own right. Saw Gerrera and Wat Tambor both factor into the book as does the aftermath of Revenge of the Sith. None of this feels like fan service either. Rather, there’s a sense of the overall plot transitioning between eras here and it’s a lot of fun to see how the two tie together. Albeit very grim fun given the subject matter. So, all in all Catalyst is a success albeit a qualified one. If you’re a fan the structure and placement of the story will be at least as enjoyable as the story itself. If you aren’t, then nothing here will change your mind.